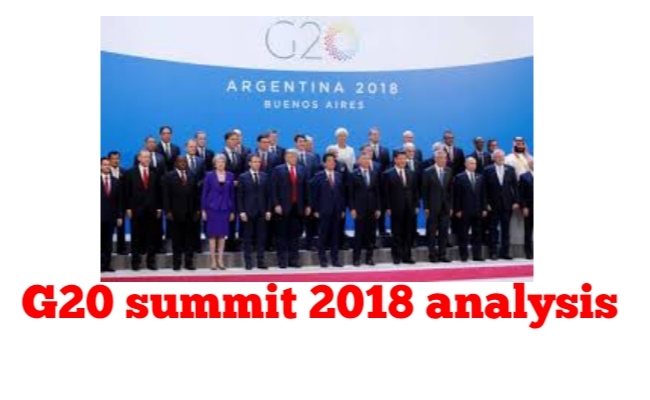 Complete G20 summit 2018 analysis from vikasanshil faculty. G20 is the biggest G-group whose summit held recently in Argentina. There are G groups like G4, G7, G20 , G15, G10 and G2 out of it G20 is biggest group. The group G10 refers to the group of countries that agreed to participate in the General Arrangements to Borrow (GAB). The group of G15 is an informal forum set up to Foster cooperation and provide input for other international groups. G7 country is group of developed country. In 2014, It was group of G8 Nation but Russia acquired Ukrains important province Cremia in Russia because of the reason other country banished Russia from G8 group so now only G7 group remained. G4 is group of Brazil, Germany, India, Japan. These 4 Countries want a permanent seat in UN security council. G2 country is group of world’s 2 powerful country China and USA. As we said above G20 nation is biggest G-group. 1) world’s 2/3rd population contain in it. 2) 75% of world’s international trade runs through these Countries. 3) 85% world’s Global Gross Product is situated in this group. 4) G20 Nation has 80% of global investment in research and development. Note-: G20 is a forum, it’s agreement or decision have no legal impact, but they do influence countries policies and global cooperation. G20 group was formed in 1999, while the repercussions of the Asian financial crisis of 1997 still lasted. It’s inaugural meeting took place in Berlin in December 1999. After 2008 global financial crisis PM and President started to represent their country in G20. Note-: G20 group doesn’t have any permanent staff, headquarter or summit. Each year it’s summit changes like UN and world bank. G20 is only a forum. The country which is hosting p arranges all things for that summit. Traditional topics of debate center around the global economy, financial markets, tax and fiscal policy, trade, agriculture, employment, energy and fight against consumption. G20 groups , other elements of recent agenda includes the advancement of women in job market. The 2030 Agenda for sustainable development, climate change, global health, anti-terrorism and enclusiex enterprunership among others. The G20 basically focus on a broad agenda of issues of global importance. Although issues pertaining to the global economy dominate the agenda, additional items have became more important in recent years. Along with G20 members some other countries also attend meeting ? Yes, Besides G20 members some country are also invited every year. Spain is permanent invited country and has attended every G20 summit since 2008. Each year, the host country invites a member of additional Countries at it’s discretion. For, the 2018 G20 summit. President Mauricio Macri was invited Chilled and Netherland. 2018 invited Countries-: Spain, Jamaica, Chile, Netherland, Rawanda, Singapore. For every year G20 Presidency is choosen by member country for 1 year. In 2018 Argentina had hosted G20 summit and presidency. As we discussed above the best country arranges all things simultaneously host country always gets presidency. As the G20 has no permanent Secretariat, the role of the presiding country is critical to the forums effectiveness. The group of G20 Countries and presidency divided in following 5 groups. Each year only 1 group is selected and other countries vote for one country to host the G20 summit. 13th 2018 G20 summit was hosted by Argentina in Buenos Aires. Note-: 2018th G20 summit was hosted by Argentina which is part of the South America. It was first time that South American Nation hosted it. census for fair and sustainable development. In G20 country all BRICS nations also comes So, they host informal meeting. This time informal meeting was held in Argentina but formal meeting which is actual BRICS meeting of 2018 was held in South Africa. We expect that you understand G20 summit 2018 with analysis by expert faculty member from economics.